SOTU EXTRA: What is the black box? Amid the mystery of missing Malaysia Airlines flight 370, analysts and investigators often point to the need to find the “black box” to help determine what happened to the missing airliner. Monday marks the 61st anniversary of the invention of the black box by Australian researcher David Warren, a device that has provided critical in finding clues from former crashes. It is important to recognize the evolutionary process that shaped aviation security measures that airplanes experience today. During the post-World War II era, airlines began transitioning into the jet age, defined by speedier travel times and higher flying altitudes. The Boeing 727 became the first U.S. short-haul jet airliner, and opened to passenger service in 1963. Though the first two years proved extremely safe and reliable, a series of four accidents in 1965 focused attention on the need for airplane safety. As a result, two flight recorders were put onto every U.S passenger airplane – the Cockpit Voice Recorder (CVR), which delivered sounds from the cockpit during the last 30 minutes of air travel, and the Flight Data Recorder (FDR), which recorded five parameters during a 24-hour period: altitude, heading, airspeed, time, and acceleration. The addition of these two devices proved instrumental for investigators, who were now able to recreate and evaluate events leading up to a crash. The two recorders are enclosed inside what’s commonly referred to as the “black box” – a nearly indestructible container that, rather as its name implies, is actually painted bright orange in color for easy detection amidst the wreckage. Early designs of the black box were only required to withstand an impact of 100 G’s, or 100 times the force of gravity. 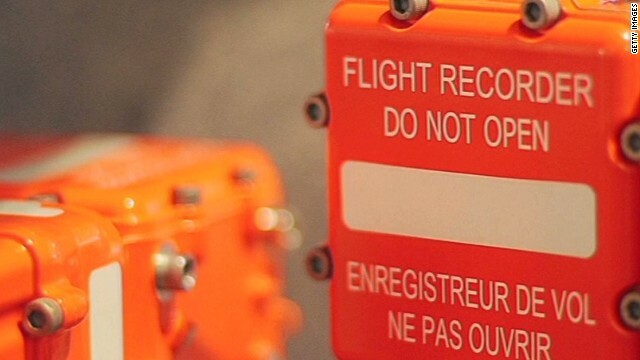 The first ever black boxes were placed at the front of the aircraft, until the Federal Aviation Administration (FAA) moved them to the back of the plane, calculating that, in a crash, the back end of the plane is traveling at a slower speed than the front during the moment of impact. Multiple tests are done to ensure the survivability of a black box, including sustained exposure to fire, and firing a cannon at the device to mimic crash impact. The black box has undergone various improvements since its invention in 1953. The Flight Data Recorder first had limited capabilities that enabled it to only record five parameters. Now, with advanced technology, it can record more than 88 parameters for information regarding the engines, flight controls, flaps and more. The box can now withstand an impact of 3,400 G’s and temperatures of 2,000 degrees F for at least 30 minutes. The transponder was another technological advancement added to the cockpit of airliners in the 1960’s to help the Air Traffic Control (ATC) system ensure control of more air space. The transponder is a dual-action device that receives a radar signal from ATC, and then sends its own signal back to the controller, resulting in a brightly colored notification on the controllers’ screens. Early requirements for transponders were only required on commercial airliners to prevent midair collisions in air space, but by 1975, the FAA required the use of transponders in all aircrafts. They also began installing secondary computerized systems so that controllers could use the signals from transponders to detect real-time flight information in a three-dimensional graphic. This Air Traffic Control Radar Beacon System (ATCRBS) not only works to transmit communication, but it also allows controllers to detect an aircraft’s identity and altitude through use of the on-board transponder. David Warren first shared his innovative black box idea 61 years ago in a published paper entitled, “A Device for Assisting Investigation into Aircraft Accidents". Now, as the search continues for missing Malaysian flight 370, future improvements to aircraft detection may be underway. Interest in these kinds of enhancements also came after the deadly crash of Air France Flight 447 when investigators were not able to recover the plane’s black box for more than two years. Advancements might include technology that could transmit real-time flight data to ground control, reducing the need to recover the physical flight data recorder after a crash.